While Science Fiction has long been the genre that I've been most passionate about, I've grown exceedingly fond of the Gothic blend of horror fiction that's out there. When in college, I attended an upper level English course titled Gothic Tradition which reintroduced me to the likes of Washington Irving, Mary Shelly and Edgar Allen Poe, while introducing me to H.P. Lovecraft, Shirley Jackson and others. I've come to view this genre as one that's largely atmospheric, with some astounding stories in it. 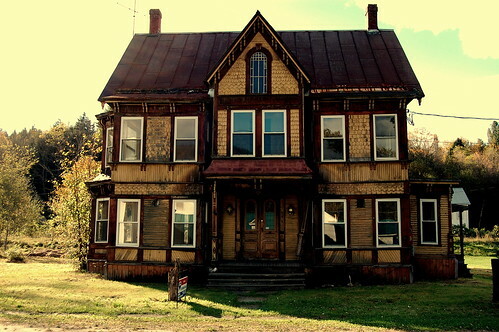 Earlier this year, while attending ReaderCon, I went to a panel titled New England: At Home to the Unheimlich, which looked to the premise that there is something about New England in particular that has helped to foster some of the best gothic-related stories out there now. Getting out and about during the fall is a good way to see this come to life. This panel had gotten me thinking about how New England would foster some of this. When I was younger, I remember visiting Boston with my mother, and we had walked through a cemetery, one that dated back to the earliest days of the country, and we saw patterns of dates, usually corresponding to illness and pandemics that occurred at the time. As a result, I've been fascinated by some of the older cemeteries that I often see here in Vermont, dotting the countryside. The panel at ReaderCon discussed a couple of specific influences: the weather and harsh seasons were - and are - a big influence in the mentality of New England residents. Winters are long, with very short days, long nights, and with clearly defined seasons. The Fall in particular is a wonderful time of year, with a broad range of colors in the hills, leading to bare trees in just a couple of short weeks. Coupled with the geography of the region: mountainous, with numerous small valleys, hollows and forests, the region is one that can be very dark, chilly, prone to fog. Further coupled with a writer's imagination, and the northeast is ripe for setting the fantastic. 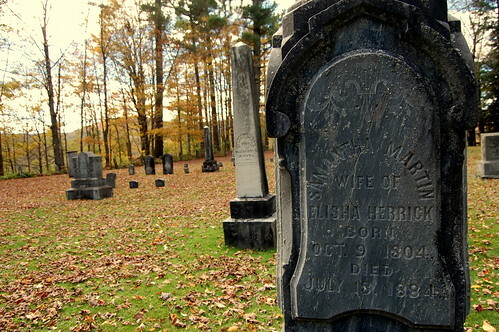 Vermont in particular had a number of small cemeteries, and a very hard, rural life from the 18th and 19th centuries. 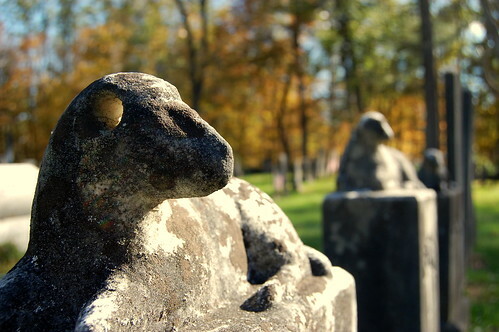 Visiting one of these places, sometimes sparsely maintained, out of operation and crumbling, one will find grave sites that date back to the early days of the nation. In several, I found the resting places of soldiers who served in the American Revolution and Civil War. Along with the history of gothic / supernatural horror fiction that existed throughout the United States, and with the seasons turning here in the state at the moment, it's a good time to visit a number of these sites. Their existence, small cemeteries, abandoned houses and cold forests, all serve to supplement this feeling in the region. Cemeteries in particular serve as interesting reminders. While Megan and I walked through one such site, she noted that there was far more emphasis on the reminders of mortality and the fragility of life, especially when compared to their modern counterparts. The careful artwork that is now vanishing from the weather and acid rain is highly symbolic, with doves, willow trees, lambs and crosses representing the end of life, while epitaphs go straight to the point. One such memorable entry that I saw on a grave in Northfield read to the tune of: Don't forget about me. Death is a debt to life, and I have paid mine: it is coming for you. Similarly, looking at the ages and years in which people had died is revealing. In each cemetery, there were several graves of for children, often from the same family, close in age, with their deaths at similar times - one such family lost six of their children in Barnard. Soldiers from war, and younger men and women had died, while a number of people likewise passed away in their eighties, with very little in between the extremes. Over the past couple of weekends, and in the upcoming days of October, I've been working on visiting and taking some photographs from some of these cemeteries (and aging homes from the period, when I can find them) which really exemplify the gothic and horror feel of the state. You can see the gallery here.